// text, else the scroll view will jitter and jump. The height constraint on the text view needs to get a priority less than 1000, e.g. 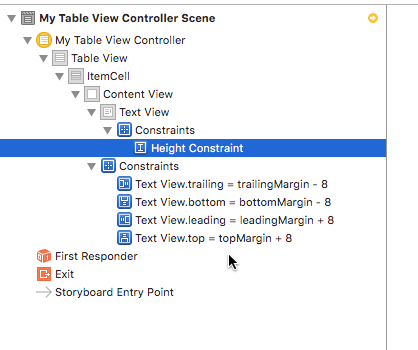 999, else it will give a conflict with a constraint that iOS will add on the fly when instantiating the cell. 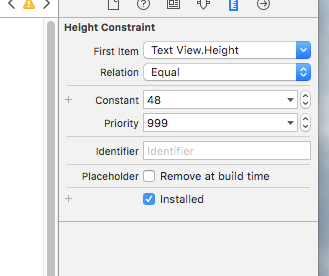 Interestingly, even though your own height constraint gets a lower priority than the system created constraint, still it will work fine. You then need to bind the height constraint to the outlet in the ItemCell, and the text view to its outlet in the ItemCell, as well. The result looks like in this very brief movie I posted on Vimeo. Interestingly, the size change happens with a smooth animation even though I didn’t animate the change in the size of the text view as I had to do in the previous project. The animation originates in the table view itself, so it comes for free. Because there are a number of things you need to set correctly in Interface Builder, and some details I may have glossed over here, I’ve posted the entire project for your downloading pleasure. Again, as in the previous post, this is all Swift 2.x and XCode 7.3.